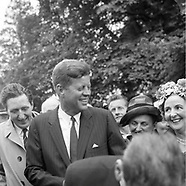 In 1963, American President John F Kennedy visited Ireland. The welcome he received rivaled that of any of the decade's rock n rolls stars. JFK's visit was preceded by his brother Ted in 1964. In the decades that followed Ireland continued to welcome the most high profile Presidents and political figures from the United States, including Richard Nixon, Ronald Reagan and Bill Clinton. When President John Fitzgerald Kennedy touched down on his ancestral soil in June 1963, the welcome he received would rival that of any of the decade’s rock and roll gods. Thousands of people turned out at Dublin Airport to greet the President as he arrived, and tens of thousands more swamped the city centre awaiting the Presidential motorcade. Irish and American flags, flowers, banners and bunting were clutched in hands along the eight mile route from the airport to the Irish President’s residence, and a continual chorus of cheering and applause echoed across Dublin as the John F. Kennedy travelled through the city centre. Eight of his grandparents had immigrated to America within nearly a single month and as part of his inaugural visit to Ireland the President visited the family homestead in Dunganstown, County Wexford. From the rousing speeches he made during his tour of the country, to the grand receptions he was given at Áras an Uachtaráin and poignant scenes as the President greeted family at his ancestral home, these images have captured a unique event in Irish history. On August 22, 1962 General Eisenhower touched down for a four-day visit to Ireland accompanied by his wife Mamie and their two grandchildren. An old friend of the General, former Irish President Sean O’Kelly was the first to greet Eisenhower as he stepped off the plane, whilst his wife, wrapped in a mink stole and presented with a bouquet of red roses tied with green silk ribbon was welcomed by Mrs McCloskey, the wife of the American Ambassador. The Eisenhowers split their time between Dublin, Wexford and Wicklow. During his visit to Roundwood and Wexford the General visited the Barry Monument, a vast bronze statue of Commodore John Barry, the famous Wexford-born seaman. When it had been unveiled six years earlier, the then President Eisenhower sent a message to the townspeople as a tribute to Barry, often referred to as “The Father of the American Navy” for his contribution to US naval forces. Eisenhower then received his own replica statue for the White House. During his visit to the Memorial a Guard of Honour was formed by the local F.C.A for the General, and a wreath laid at the plaque across the road from the memorial for those Wexford seamen who “gave their lives that we might live.” On August 25 hundreds of people lined O’Connell Street in Dublin’s city centre to bid farewell as Eisenhower and his family travelled to Cork where they were greeted by thousands more cheering people. They were departing that day on an American liner from Cobh harbor in Cork.